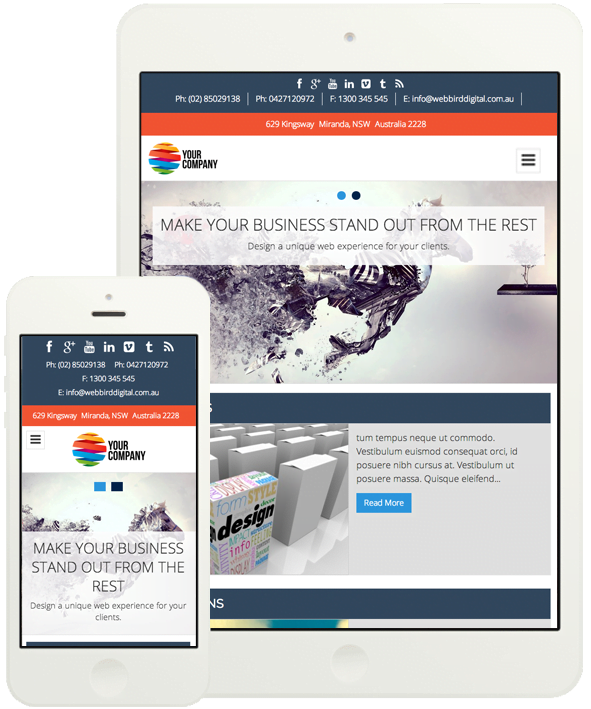 Our Wordpress Business Template is 100% mobile friendly and can be viewed perfected on any device so you can be assured that your website will capture all users and convert more leads. One of the most effective way to get your website and business more traffic is to have a strong social media foundation. We've made sure that social media is a priority with this package. Not only does it send visitors from your website to your FaceBook, Twitter & Google+ pages but as you grow your social media presence it's a simple one step process to add new social media links to the site. It's a well-known fact that the better your search engine ranking, the more people are likely to visit your website. We have installed to best SEO plugin for WordPress so you have everything you need to optimise your site. We’ll help you get the most out of your website by installing both Google Analytics and Webmaster Tools for your site so you can always see who is visiting and track your website performance. Our Business Package comes with fast, secure and reliable Australian cloud based website hosting for just $30 per month. Every client is special to us. We pride ourselves on a personal touch and high standard of customer service. After launch you will get WordPress training for your business package and ongoing phone support. If you already have your logo and all your content ready to go we can have your new site up in no time at all! Our WordPress website package will get your business online fast with a beautiful, modern, fully responsive website that works hard for your business. Our WordPress website package is a marketing workhorse! Your website is the most effective marketing tool you have – don’t underestimate its significance. Gone are the days where a simple ‘brochure’ website would bring customers to you, now websites have to work hard to attract, inform and engage. If you want to compete online you need a Google-friendly website that has the power to adapt and evolve with your business needs. Our new WordPress Website Package will work for your business. It will build your brand, boost your web rankings, bolster your credibility, and make it a breeze to do business online. Our WordPress website package includes up to 8 pages of content uploads by us, 4 free stock images and the launch of your site. You also get access to ongoing support to assist you if and when you want to expand your site. 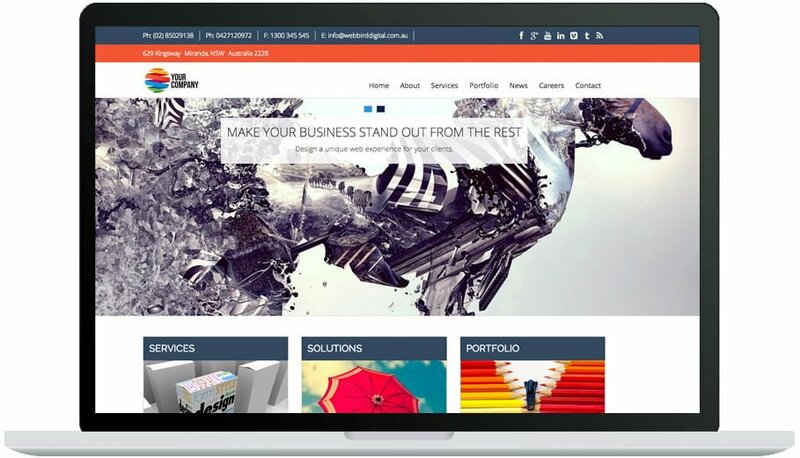 The Web Bird Digital Business Website Package is built on a WordPress Content Management System platform so you can update and manage the site yourself in the future if you choose to. We designed this WordPress business website to load fast and display beautifully on all devices from mobile phone to desktop computers. It is fully customisable and incredibly easy to edit and maintain, giving you complete control over your branding and content. Starting from $2,499* our original WordPress Business Package is one of the cheapest professional websites that you will find. This price includes everything that you need to complete the website. Many of our customers use the WordPress Business Package as a base and have additional features or designs custom developed, Contact us to find out more. *All prices quoted are excluding GST and subject to change at any time without notice. “We just started our new Baybreeze Café and the new website. The site is easy to use and navigate, ultra-modern, stylish, interactive, has a great layout and very responsive. The website has allowed us to build a complete new clientèle with the Café generating $100,000 sale revenue in the first month.